Merry Christmas! More than a month has passed since the last furball featured in this series spread across my InterWebs. Meet a kitty I call Star, who punctuates one of the neighborhoods’s better holiday homes. I don’t recall a year when so many houses here decked the halls with outdoor lights and Christmas decor. Perhaps the festive feeling reflects a change I previously mentioned: Influx of families with children. I captured the Featured Image, unexpectedly, off Madison, using iPhone 7 Plus on Dec. 19, 2016, at 5:54 p.m. PST. Vitals: f/1.8, ISO 100, 1/8 sec, 3.99mm. 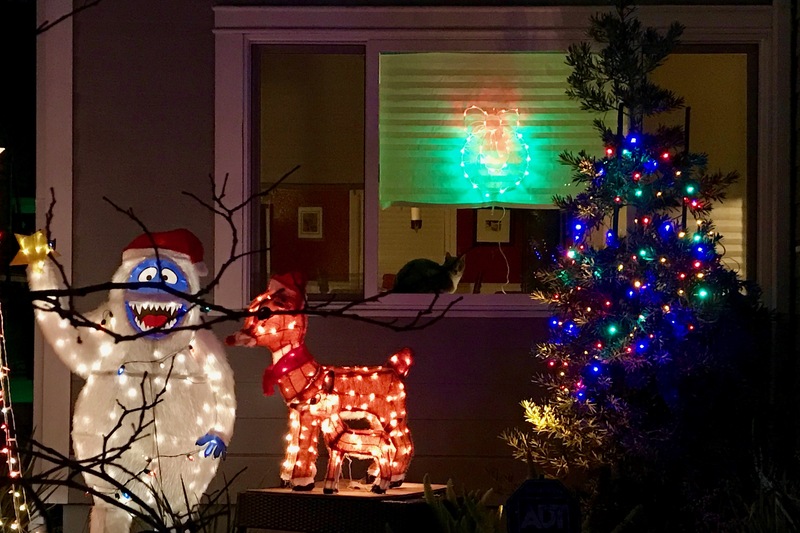 I chose not to use the second lens to zoom, so as to compose with Abominable and Rudolph. Unusual rains thwarted my efforts to get back and shoot a better candid using the Fujifilm X-T1. Flooding closed the back parking lot to local mall Fashion Valley and to the North and South exit ramps off I-8 onto 163. Other felines featured in this series: Scruffy, Roly Poly, Woo, Skull, Biscuit, The Colonel, White, Chipper, Frisky, Stretch, Needy, Farfisa, Mates, Hunter, Pee-Pee, Blue, Blue Too, Bonded Pair, Patience, Fess, Jumper, Frenemy, Looker, Cozy, Scout, Lurks, Skit, Mini, Betty, Black and White, Stalker, Bell, Chill, Sammy, Scratch, and Poser.